Imagine how your life would change if you suddenly had money left in your monthly budget. What would you do with that money over time? Beef up your emergency fund? Pay off your car? Finally take the vacation you’ve always dreamed of? It can happen! Just take stock of your spending and identify areas where you can save. When you make a few tweaks to your expenses, you could be surprised at how much money you have left in your budget. In today’s episode I want to share with you 15 Practical Ways to Save Money. Do you find yourself wondering where your money goes each month? To help you I have created a free course that takes you through the process of getting control of your money. You’ll learn how to track your household budget and find the money to get the life you really want. I put together this free 2 part spending plan class to walk you through the entire process. In Part One we discuss the budget process and explain the importance of the different steps. In Part Two I will walk you through the process by creating a sample spending plan and explain the process in more detail. Instead of wondering where your hard earned money went learn how to create a spending plan and gain control of your finances. Welcome to Feb. Well, we’re a month into the New Year, how are you doing so far? How are your New Year’s resolutions going? Are you still on track? Probably not. Most of us get off track within the first few months of the year. We just keep on marching forward in life, day after day, traffic jam after traffic jam, cubicle after cubicle. Life is moving faster and faster, month by month, year by year but we’re really not getting anywhere. Why do most of us fail at keeping our New Year’s resolutions and what simple change can we make that will help us achieve what we want to accomplish in the future? Well that is what we are going to discuss on today’s episode of the ProsperityRx Podcast. So lets get on with the show. Every December and January we RESOLVE to change our path. To get healthier. To become fit. To get out of debt. To save money. To do something different yet within the first month or two we fail to change. December is a month attached with lots of emotions. As the holidays close in we get caught up in an emotional roller coaster. We’re in a giving mood but realize, no matter how prepared we thought we were, our finances aren’t in line with emotional aspect of giving. Family dynamics during the holidays test our emotions. And then the hustle and bustle of the season combined with all the special foods and holiday treats, we find ourselves not making the best choices when it comes to our health and what we eat. On top of that, after the holidays have past and we start facing a New Year we reflect on the failures of the past year and we tend to make resolutions for the New Year that are overly ambitious and destined to fail. As the New Year starts we are a bit apprehensive because we really don’t know what the New Year will bring and at the same time we realize that we have set the same resolutions in the past and have failed to succeed in completing the resolution, many times year after year. It’s important to set some intentions for positive change in our life for the New Year, to hit the refresh button, so we need to take a different look at how we set those intentions for this New Year. By definition, resolutions are more do-or-die which makes them more intimidating and more likely to fail. The definition of resolution is “a firm decision to do or not do something” or “the action of solving a problem, dispute, or contentious matter.” A resolution tends to be ridged and inflexible. More conducive to failure. Nearly 90 percent of those optimistically life-altering plans fail. And, that’s never good for our ego. It makes us question ourselves. It makes us want to avoid making future commitments to ourselves. It makes us not just quit our plans to make ourselves better, but it can actually turn us in the wrong direction. The “I want to eat salad for lunch everyday diet,” doesn’t just derail into a simple tuna sandwich and a bag of chips. Our frustration instead leads us to a box of donuts, with a side of fries. Just by these definitions alone, a goal sounds more attainable. Instead of setting a “firm” resolution that requires a very specific result we need to set a goal which is a part of a journey and enjoy the road to reaching a better place in our life. While resolutions seem set in stone, goals are more malleable. Achieving a goal is an entirely different process than achieving a resolution. For example if we set a resolution to eat healthier we become more obsessed with the result. If we cheat we feel like we failed completely. Do it enough time and we lose our resolve. Meanwhile if we set a goal to eat healthy, if we slipped up, it didn’t ruin our intention. We can start over tomorrow and continue to work toward eating healthier. We hadn’t broken an ultimate or overarching rule. If we set a resolution, every day will be a battle to uphold that resolution but if we set a goal every day will be a journey toward that goal, with ups and downs, good days and bad days. By the end of the year we will be able to look back on our year and think about the progress we made toward our goal and be proud of the work we put in instead of evaluating whether we did or did not uphold our resolution. Ultimately a resolution is a pass/ fail grade while a goal is graded on an A-F scale. If we don’t reach the goal we have at least made progress and we can continue that progress into the next year. Setting ourselves up for success in the New Year is one of the most crucial aspects of goal-setting. Bettering ourselves involves challenging ourselves, but we also don’t want to force ourselves to do anything we simply cannot achieve. When setting goals, it’s important to consider how we’ll achieve it. Consider the steps we can realistically take to get there, breaking them down into baby steps that we can accomplish along the way, giving us little wins that keep us motivated. Setting goals that aim too high are bound to fail, setting goals too low can also be similarly bound for failure. When we set goal and then break them down into baby steps, our minds perceive them as easy to achieve. And as we progress along the way, we feel a sense of reward. Here are a few tips to help us with our goal setting. Never shoot for sameness. It makes sense that trying to remain the same can lead to failure, because there is nothing more natural than change. Expect to change. Strive for improvement. Make it public. Sharing our goal holds us accountable to achieving that goal. Tell our friends and family. Tell our coworkers. And be vocal about our intentions and progress. Make it focused. Being a better boss, becoming rich, or losing weight are hard to quantify unless we get focused and specific with our words. We should define each step toward our goal, and stay focused only on the next step. Make it scalable. While we can all hope to find a Genie to grant us wishes, the truth about achieving any change is that small actions eventually create large results. Don’t be discouraged by small change. Applaud it. It’s part of the process. Weight is lost pound by pound. Money is made dollar by dollar. Books are written one word after the other. Give it consequences—both good and bad. We all hold ourselves more accountable when consequences are present. Set consequences—plan something that stings a little when we fail, and celebrates when we succeed. While many goals focus on quitting negative habits, others should focus on adding rewarding habits. For example, it’s great to say we want to quit smoking or quit eating French fries. But, if we quit something negative, we should also add a goals to do something we enjoy—like having a date night with our spouse. Seek support. There are few more powerful things in life than knowing someone is cheering for our success. When we set a goal, seek out a person who will support our decision and be our champion. And, even if we’re not chasing the same goal, to become a cheerleader for their goals as well. Manage expectations. There’s a reason we didn’t achieve all our goals in the past. We can probably list many of them—we got busy, distracted, stressed, and so on. Know that while we’re trying to create change, a lot of our life demands won’t change. We’ll still be just as busy. We’ll still find distractions. And, we need to manage our expectations when setbacks happen. Don’t throw in the towel. We also have to consider why we are setting the goal in the first place. If we’re not doing it for us, what are we doing it for? Having a really big why increases our chance of success. While a resolution to do something specific in the New Year feels like it must be completed by December 31st. Let’s be real, we are fallible creatures. Life is hard and sometimes it gets the best of us. Sometimes, the outcomes in our own lives are out of our own control. Since so many things in life are out of our own control, why are we so hard on ourselves when we don’t meet a resolution by the arbitrary deadline of December 31st? It’s better to set a goal, so we can evaluate our progress and adjust along the way rather than write off a failed resolution and give up on it. Life is hard enough without the added pressure from ourselves. A goal can be a symbolic finish line that we’re working toward, whether the finish line is December 31st, or a metaphorical point we aim to reach for over the rest of our life. When life gets the best of us and circumstances happen that are out of our control, with goals we can reevaluate and adjust, eliminating the feeling of failure that we experience when we “break” our resolutions. We should all absolutely aspire to our goals and light fires under our asses to achieve them, but at the end of the day, and the end of the year, it’s important to show ourselves some love for everything we’ve already made happen in our life. To celebrate our successes. Change is inevitable. It’s going to happen. And, that means we should all focus on setting goals to make the best changes possible. Best wishes in 2019! 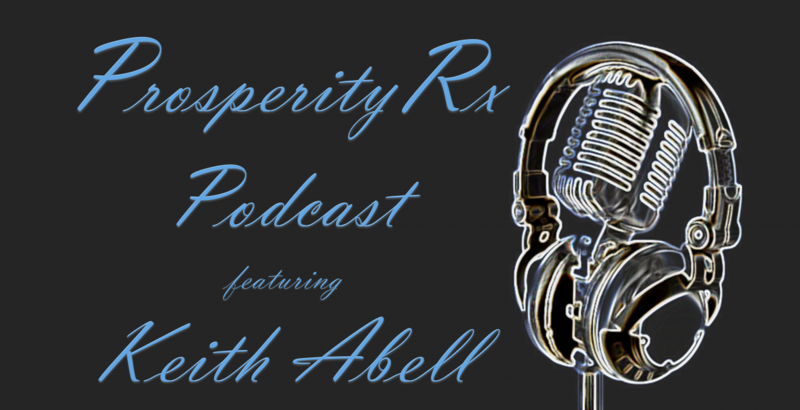 I hope you enjoyed this episode of the ProsperityRx Podcast. If you did find value please subscribe and feel free to share it with others. You’re not alone. People at every point on the financial spectrum experience the same feelings of frustration and stress that can come from not having complete control of your finances. One of the first steps to achieving health, wealth and prosperity is to get control of your finances. And the first step to getting control of your finances is to create a spending plan. A spending plan is how you tell your money where to go instead of wondering where it went. A spending plan is the most important part of getting out of debt and gaining control of your finances. Once we began following our own spending plan we were shocked to see all the ways money was wasted and how quickly we could start paying off our debts. By getting control of every dollar we finally were able to get out of debt and start building for our future. Until You Know Why, the How Doesn’t Matter. Define Your Dream and have a Burning Desire to Achieve It! That’s the first step. That’s always been the first step. It is still the first step. Until you know why you’re on the Financial Peace journey, or building a business, or really anything else you want to accomplish in life, until you know why, the how doesn’t matter. You have to take the time to ask, “OK, what do I want to accomplish from this journey?” You have to decide. You aren’t going to make it. If you don’t know why the how doesn’t matter. At the end of 2011, 3 weeks before Christmas I lost my pharmacy position. Long story short, they were replacing those of us that had been there quite a while with new grads that they were paying 20 grand less than I made before. After a year of ny finding temporary or part time work I decided to get involved in my first side gig business outside of pharmacy. I had three goals that compelled me. Number one, I wanted to save my home, the dream home that I built with my own blood sweat and tears, I wanted to save it from being sold or foreclosed on while I was underemployed. Number two, my Malibu was on its last leg and I needed a new car. Number three, I needed to finish paying for my youngest son’s private school tuition. That’s why I got started in this business. Now my goals of course have changed since then because I was able to accomplished all three of those with the help of this business. But those were the first goals. Until you have that and it is inside of you, you will not make it. You will fail. Those principles apply to anything you want to accomplish in life. In this episode I apply these principles to the financial peace journey and show you how to define those dreams and then ignite that burning desire to accomplish them. Do you want to fail or do you want to succeed? In this podcast we are going to talk about defining your dreams. Until you know why the how doesn’t matter. Until you know why you’re doing ANYTHING, the how doesn’t matter. You have to take the time to ask, Why do I want to become debt free? What can I do or become if I’m debt free? What do I want to accomplish in life? You have to decide. Now is the best time to start taking control of your money! I’ll be covering many topics to teach and encourage saving and debt freedom. Be sure to subscribe to this blog at ProsperityRx.com to learn how to save money, make a budget, pay off your debt, reduce your taxes and invest for your future. And if you found value in the information that I’m providing please like and share this with others. On today’s podcast I want to talk about the “Mindset Pendulum.” What goes on inside your brain as you embark on the financial peace and prosperity journey. Once you have an understanding of what’s going on in the 6 inches between your ears then you have a better chance of recognizing how your thoughts affect your success and you will be better equipped with ways to change what Zig Zigglar refers to as “Stinkin’ Thinkin’.” You will be able to stop the stinking thinking and get yourself back on track. In your brain there is this pendulum swinging back and forth. When you start this journey you have attitudes, opinions and beliefs. All of us. We have opinions about everything. We have opinions about things we don’t need to have opinions on. We have attitudes which are stronger. Strong feeling about things. And we have beliefs. We are made up of opinions, attitudes, and beliefs. That’s what happens. Then we go into the world and somebody says, “You can’t live without credit, you’ll never buy a home or a car” . . . Then what happens to that opinion? It goes back to negative. Then we hear callers give the “Debt Free Scream” and are all fired up and our pendulum swings back to excitement. Then you get on facebook and you see all the posts from your so called friends about their exotic vacations and the luxury car or boat that they bought while you are on a “beans and rice” diet getting out of debt and your pendulum swings back to the negitive. This thing swings daily in the beginning. Your pendulum is going to swing. It’s normal. Sometime we think we’re going crazy because we’re up and down about it. Because we are all made up of opinions, attitudes and beliefs. If you just hang in there eventually your opinion will become an attitude. And it’s stronger. Then over time the attitude becomes a belief. That is in anything we do in life. Not just on the financial peace journey but in business as well. We get involved in whatever we make a commitment to and think we don’t like this swinging back and forth in our mind so we think something is wrong. Sometimes they’re excited and sometimes we want to puke. Its just the way people are and most people can’t get through this because they don’t understand what is really going on in their mind.. Listen to my podcasts or watch my video blogs. Catch Dave Ramsey or one of his team members on the radio or over the internet. Stay plugged into folks that are on the same journey as you and folks that have gone there before. It will calm your pendulum down. So you have to understand your pendulum will swing. But if you continue and stay on the right track, it will get to a point where it just doesn’t swing as bad, and eventually just doesn’t swing any more. Stay plugged in and when you get to a point, it just doesn’t matter any more.